Bentley Systems, the leading solution provider for sustainable infrastructure, has just introduced series 5 releases of WaterCAD, WaterGEMS, and HAMMER V8i. These information modeling softwares will be ideal for studying and designing of water distribution system effectively. Integrated with BIM capabilities, these softwares expand information mobility toward water system planning, design, engineering and operations. The collaboration will be enhanced inside the stages of the infrastructure lifecycle, and superior decision can be taken for improved project and system performance. With these new products, the modelers and operators can get better visibility, forecasting, and decision-making support. The system modelers will be able to import supervisory control and data acquisition (SCADA) data automatically into their hydraulic models to be utilized as initial conditions. System operators can circulate model results to the utility’s accessible SCADA system control screen through the industry-standard OPC communication protocol , facilitating forecast operating conditions. The system operators can assess and envisage model predictions directly in their regular user interface. The hydraulic modelers are benefited with strong visualization tools to check SCADA signals while they are modified concerning real-time events as well as view events when they occur and improve decision making. 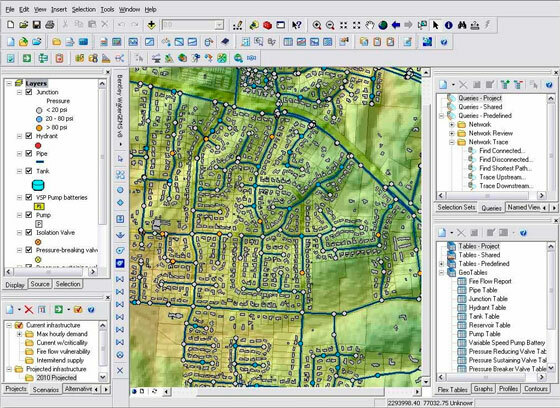 The WaterCAD and WaterGEMS V8i (SELECTseries 5) software are applied to unambiguously model water demands for individual water customers in their exact physical locations. The modellers can get more clarity as well as manipulating power over where demands are distributed and handle those demands efficiently. WaterCAD and WaterGEMS users can test multi-species water quality analyses. HAMMER users can test multiple scenarios as a batch run, like the batch run functionality in WaterCAD and WaterGEMS. WaterCAD, WaterGEMS, and HAMMER users will be able to use hydraulic models (including results) as i-models to be utilized with Bentley Map Mobile, an app compatible with Android, iPad, and iPad mini tablets; that can model from within the latest versions of MicroStation, AutoCAD (including AutoCAD 2015), and (except WaterCAD) ArcGIS (including ArcGIS 10.2).